Piedmont Lake Piedmont Lake is located in Guernsey – Harrison – Belmont Counties. The lake covers 2310 acres with 36 miles of shoreline. It lies within Ohio Division of Wildlife District Four(4). Location Piedmont Lake is located mostly in Belmont and Harrison counties in the eastern part of Ohio. 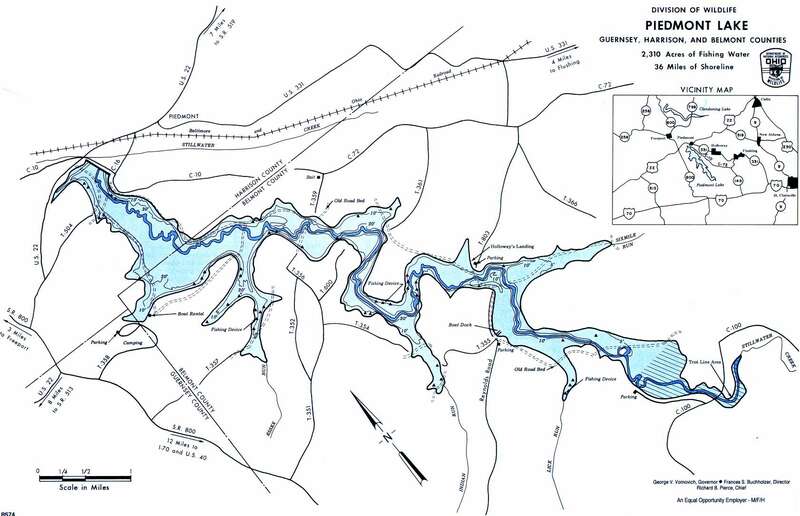 The largest portion of the lake lies in Kirkwood and Flushing Townships of Belmont County with a smaller segment in Moorefield Township of Harrison County. The lake is on State Route 22 midway between Cambridge and Cadiz approximately 10 miles north of Interstate 70 off of State Route 800.. Distance from Major Cities Approximately 90 miles south of Cleveland. Approximately 95 miles east of Columbus. Approximately 20 miles east of Cambridge. Approximately 25 miles from the Ohio/WV border. Fishing Opportunities Piedmont Lake is noted statewide for its outstanding *Muskellunge *Flathead Catfish *Channel Catfish. You can also catch; *Largemouth and Smallmouth Bass *Bluegill *White Crappie *Walleye. Boating Information There is a 6HP horsepower restriction on Piedmont Lake. Two improved boat launches are available – one is at the marina at the northern end of the lake off of State Route 800. Boats and motors are available for rent there as well. Another is located off of Reynolds Road..
State Management The Division of Wildlife activities include: *monitoring fish populations *stocking *creel studies *physical and chemical water quality analysis.